Colleen & I were wanting to get back to the McKenzie to correct the mishaps that made this year’s Two-Fly very memorable…with a major gap in our trout fly rod arsenal, I grabbed the 6 wt saltwater rod & Tibor reel (with about 300 yards of backing) and a few other superlight set-ups. I found it odd that there were no trailers or boats at the take-out / put-in on a sunny Saturday with no Duck game. 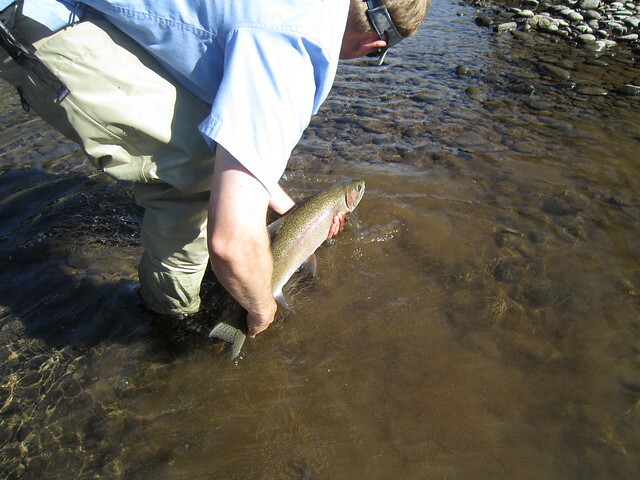 Just as the blog has recently reported, the river is fishing very well and we were catching fish consistently. As Colleen started to push us to our more preferred spots, my thingamabobber dove down like a freight train and I connected with a “native” Steelhead. After a pesky battle that never got to the backing (thank you Tibor Freestone), but included a swim between Colleen’s legs, we were able to grab the fish by the tail for a few glory shots and then released him back on his journey. As I looked around, I noticed we were all alone, no other boats, no wade or bank fisherman, or even the sound of a passing car, it was an epic moment. 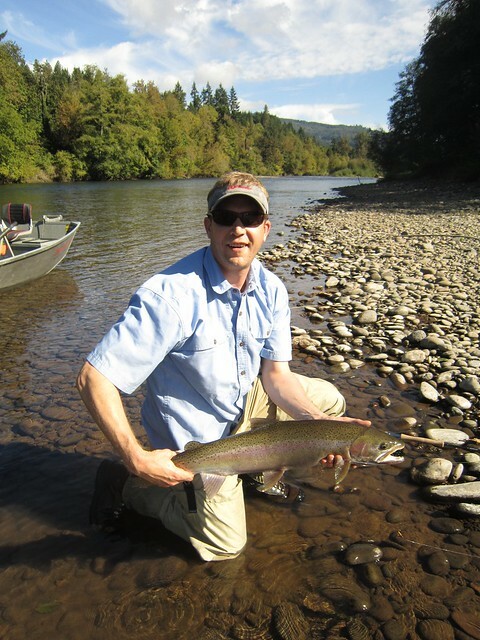 Oh yeah, the steelhead ate a Mega Prince, what else? We fished out the rest of the day catching trout consistently on dries & nymphs, but no big dogs. 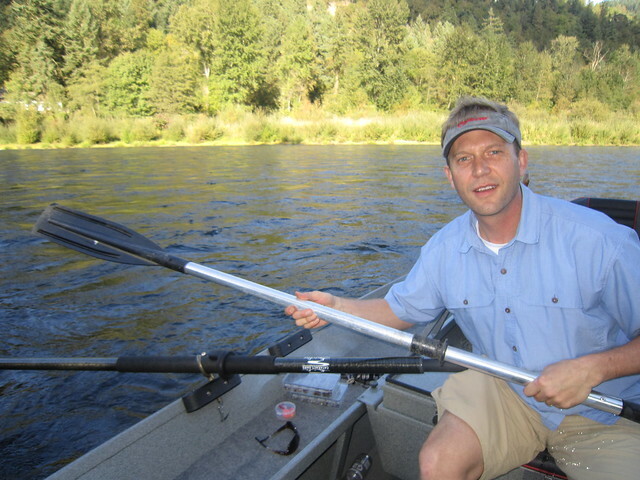 And, as usual we try to leave the river a little cleaner than when we arrive – Matt, need a spare oar? Incredibly rare “native” steelhead. 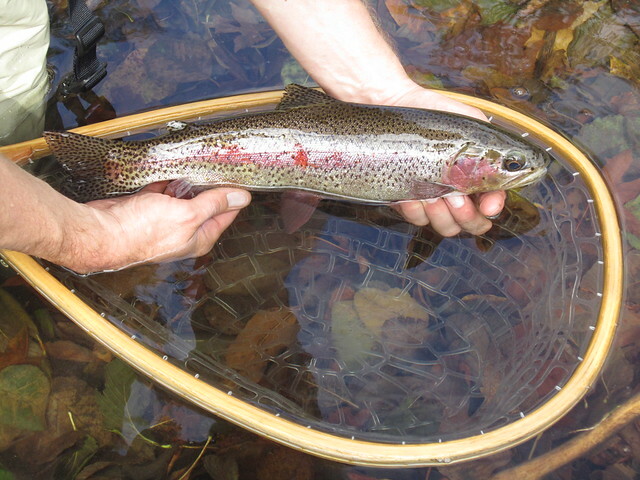 I have lived at Brown’s Hole for 35 years, and flyfished for steelhead all that time. I have never seen a McKenzie steelhead with an adipose fin. Earlier this year I made light of Matt and Chris’ complicity in the Sasquatch TV program. I apologize to both gentlemen – perhaps there is … what? I fished Monday from the dam to Leaburg in a monsoon; I was first boat in at the relaxed hour of 7:30, and didn’t touch a fish in a drift to Leaburg. I only saw one fish on a break, but rain had visibility subsurface to zero most of the miserable 4 hours. Finally, a caution to those wooden boaters – the river below the Greenwood Drive intersection is low and very technical. I do not advise running it with passengers until the river rises. We landed a very bright 9lb. hen a couple of years ago that also appeared to be a Native (All Fins attached). It was landed below the Dam and above Greenwood. All steelhead you catch in the McKenzie are native, but that is one helluva gorgeous wild fish. That fish is probably a Willamette hatchery fish moonlighting up the McK. There have been several unclipped fish in the catch this summer over there on the ugly stepsister stream. The only way to correct the “mishaps” is to actually take your boat on the Upper McKenzie. It’s an easy run…….give it a try. Matt – I’m ready when you are!!! I’ll bring the oar. Thanks for the tip on water levels from Greenwood downstream!